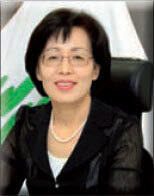 As Mayor and on behalf of the city of Songpa, Seoul, Republic of Korea, I welcome the LivCom Awards 2011. Songpa is a big city with 690,000 residents. Its historical breadth as the pivot of an ancient kingdom some 2,000 years ago remains very much alive to this day. Songpa has also elevated Korea�s national prestige by hosting the 1988 Olympic Games. At this point, we are proud to announce that we are hosting the LivCom Awards 2011. By inspiring the spirit of �Think Globally, Act Regionally� in order to cope with climate change, Songpa is building a cornerstone for sustainable growth in the areas of culture, welfare, and environment. The city is also pooling the efforts of the whole community to make Songpa the world�s best liveable city. There are also other collaborative efforts to accomplish sustainable growth of the community, including the City of Water: Water-Way Project, which connects four waterways with a total length of 27km; the Alternative Energy Development Project, which fulfils both environmental and welfare needs by supporting those on low incomes through profits from the operation of public solar power generators; the River Restoration Project for the diversity of the ecosystem; and the construction and utilisation of the 116km-long bicycle path to reduce greenhouse gas emissions and to improve the health of the residents. Songpa is the city where human beings coexist with Mother Nature, a place where one can enjoy the blue and green colors of nature anywhere, anytime, and a World Health Organisation (WHO)-approved �Safe City�. Now, Songpa, as a representative of South Korea, is ready to present its splendid culture and history to the global communities. On the 27th October The Livcom Awards take place in Korean. The event is free to view live online here - Visit http://bit.ly/livcom for further information. * Please feel free to forward the link to colleagues and friends. The LivCom Awards is the world�s only Competition for local communities that focuses on environmental management and the creation of liveable communities. The compilation of the Initial Report is a self-audit process that can provide the basis for a future plan to create a liveable community. Success in the LivCom Awards may be referred to in applications for National and International funding. During the Finals you will be able to observe Presentations that contain examples of International Best Practice applied to challenges similar to those facing your City. You will be able to showcase your City�s Best Practice on an international stage and influence accepted International Best Practice. Civic pride will be enhanced by being with �the leading communities in the world�. facing similar challenges to those faced by your community leads to the formation of partnerships to exchange information and experiences, and the arranging of exchange technical visits on an ongoing basis. These partnerships can extend to subjects beyond Environmental Issues. Awards is not large and can be exceeded by many times by the ongoing benefits. Success in the Awards may be used to promote tourism and Inward Capital Investment. National and international publicity is enhanced. Joining of an international network of communities from over 50 countries with similar environmentally based objectives. Engagement by the community is encouraged. I can assure you that participating in the LivCom Awards is professionally rewarding and will potentially bring long-lasting benefits to your City. Please contact the press team in the run-up to this year�s Finals for any information or support you might need. During the Finals, the press team will be issuing releases for each of the Finalists, a daily newsletter on the highlights from each presentation, the results and you will be able to receive photographs of individuals and delegations at the Finals.